If you are looking for beautiful, versatile window treatments for your Montana home, custom blinds from The Blind Guy will exceed your expectations. Blinds are available in two orientations, vertical and horizontal, allowing them to cover any size or shape of window in your home. Horizontal blinds are perfect for windows that open up and down; vertical blinds easily cover wide expanses of glass, such as sliding glass doors. Both types of blinds can be opened completely for an unobstructed view, drawn over the window with the slats or vanes open to provide filtered light, or closed to provide privacy and block the natural light from outside. With many colors, patterns, and materials to choose from, it is easy to find blinds that will work in any room in your home. And at The Blind Guy, we carry window treatments from four different manufacturers – Hunter Douglas, Alta, Graber, and Lafayette – which gives you even more variety to choose from. 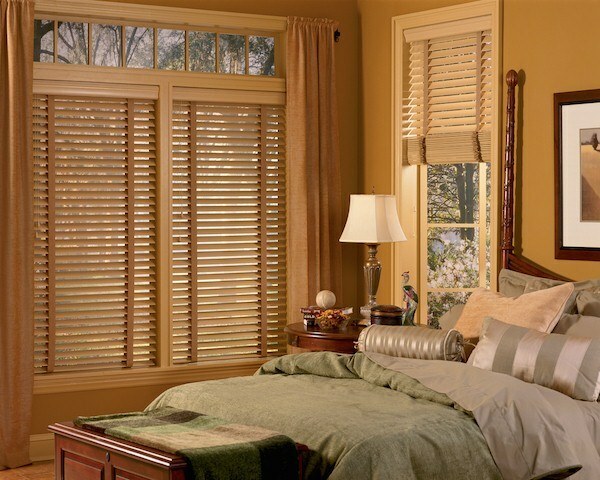 Real wood blinds – For a traditional look, nothing beats the natural warmth and beauty of real wood horizontal blinds. They can be stained or painted to match or complement your window trim. Faux wood blinds – If you would like wood blinds in a room with high heat or humidity, faux wood blinds give the appearance of wood but are better able to withstand extreme temperatures and moisture. Aluminum – Aluminum horizontal blinds give a modern feel and come in the widest variety of slat widths and colors. Vinyl – Vertical blinds with vinyl vanes are durable and easy to keep clean. They also offer many different colors and textures to add interest to your windows or sliding glass doors. Fabric – Vertical blinds are also available in fabrics ranging from sheer to opaque. Sheer Visions® window treatments from Lafayette combine sheer panels with opaque vanes for a truly luxurious look. Not sure what type of window treatment you want? Give The Blind Guy a call and we’ll bring our mobile showroom to your home at a time that is convenient for you. We proudly service the greater Flathead area, including Kalispell, Bigfork, Whitefish, Eureka, Ronan, and Polson, Montana.